An under strength Ratoath still had far too much fire power for Ballinlough to deal with on Saturday evening in the third round of the Division 3 A-League in Ballinlough. Among the players unavailable to Ratoath were county footballers; Eamon and Joey Wallace, Cian O’ Brien, Brian Power, Conor Mc Gill and Brian Mc Mahon and throw in county hurlers Gavin Mc Gowan and Darragh Kelly! The Leinster intermediate champions of 2015 have an army of quality players and judging by tonight’s performance there will be intense competition for places come the first round of the senior championship. 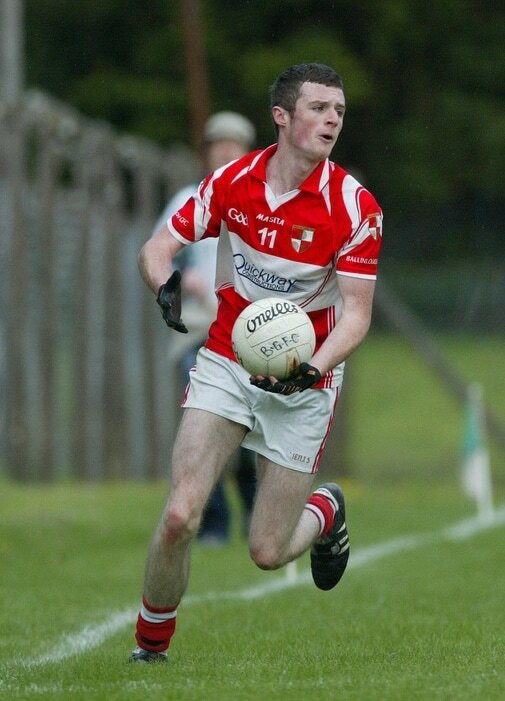 Pictured right: Michael Geraghty was Ballinlough's best performer. ​Ratoath took a while to get going; during the second quarter they begun to find their feet and the home side simply could not match their fitness, pace and ability to kick points from distance. Bobby O’ Brien was the vocal point of Ratoath’s attacking flare and he kicked a couple of early points, defender Gavin Quigley was also prominent throughout and he kicked a nice score in the 20th minute as the scores began to flow, they surged ahead; 1-5 to 0-3, at half-time. Ronan Mc Guinness was dismissed for a second yellow card just before the break as Ballinlough faced an uphill battle. Ratoath got the first score of the second half before Jack Tunney produced a moment of individual quality as his first time strike from 20 meters hit the back of the net to give Ballinlough some hope as the gap narrowed; 1-6 to 1-3. Ballinlough could only add a couple of pointed frees before the end as Ratoath continued to attack at pace from all areas of the field. Bobby O’ Brien added a second goal from Ratoath in the final quarter, Ballinlough were given a small chance of retribution when they were awarded a late penalty but Peadar Byrnes well hit penalty rebounded off the crossbar and away to safety. Best for Ballinlough were Michael Geraghty and Niall Farrelly. Ballinlough: L. Gibney, E. Mc Cabe, L. Maguire, R. Farrell, B. Smith, M. Geraghty, E. Smith, D. Muldoon, K. Byrne, M. Mc Cullen, R. Mc Guinness, J. O’ Reilly, J. Tunney, N. Farrelly, P. Byrne. Subs: J. Baugh for K. Byrne, P. Briody for Mc Cabe, A. Fox for Mc Cullen and J. O’ Higgins for Muldoon.